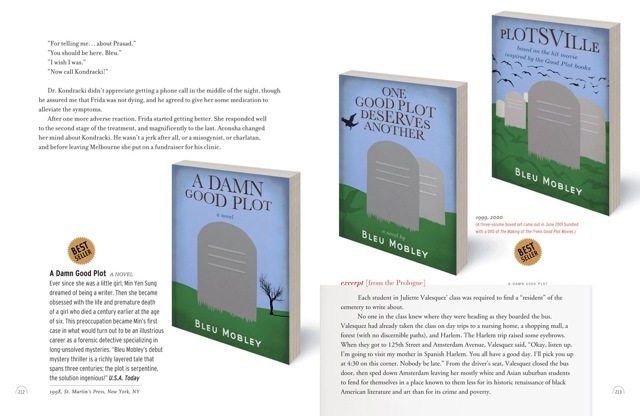 Writing a book is a monumental endeavor for any author. Dame Agatha Christie, the most published novelist in history, is estimated to have written 82 detective novels. Given this unparalleled distinction, the prospect of writing 101 books is unthinkable. But, not for Bleu Mobley. 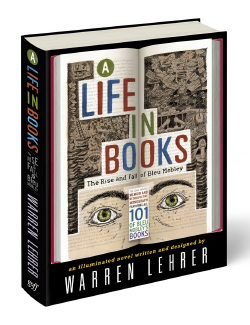 In Warren Lehrer's new book A Life in Books: The Rise and Fall of Bleu Mobley he's created a tour de force of graphic design, illustration and writing. His protagonist, "Bleu" is an imaginary and controversial author who reflects on life and career while incarcerated. The 380-page book is described as an "illuminated novel that contains 101 books within it." Exploiting a wide range of illustration styles to delight the eye, Lehrer offers a funny, thought-provoking and refreshing twist on the graphic novel. With book titles such as: The Phenomenology of Lint, The Book of Lies, The Night Crustaceans Screamed and Outsourcing Grandma, Lehrer has created a deliciously peculiar "monograph." However, because this "book of books" trades in myth, fiction and blurred truth, 'polygraph' might be a more apt description. Lehrer offers several ways that the book can be read. 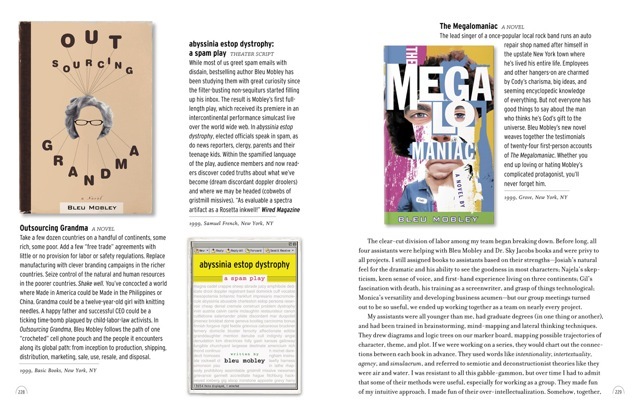 The reader can look at the clever book titles and cover designs throughout the text that are guaranteed to bring a smile. These are often accompanied by critical "reviews" that smack of satire. In addition, excerpts are provided, allowing the reader to experience "Bleu's" stories in short form. Courtesy of Warren Lehrer EarSay Inc on Vimeo. Following the book's introduction, Lehrer offers a helpful diagram on the book's structure that "is inspired by Bleu Mobley's 'book composing' techniques." Idiosyncratic in form, A Life in Books: The Rise & Fall of Bleu Mobley is a remarkable example of visual literature so rich in illustration, typography and ideas that can be thoroughly enjoyed without reading it "cover to cover." Opening this book to any spread feels like a great beginning.